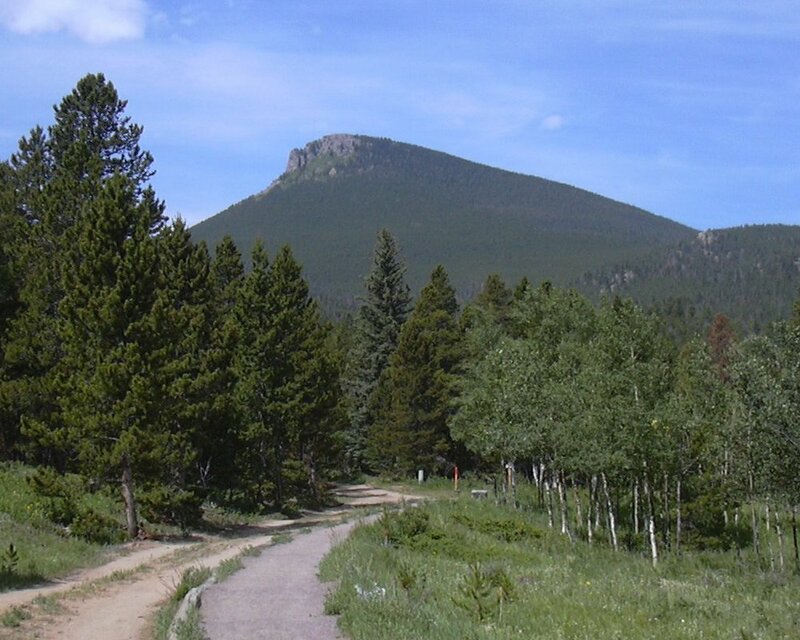 Estes Cone from Lily Lake is an alternative to the usual start at the Longs Peak Trailhead, and requires an additional 400 feet in elevation gain. This hike has a roundtrip distance of 8.4 miles, with a total elevation gain of about 2,200 feet. Parking at the Lily Lake Visitor Center, we started hiking at 10:27. From the parking area at Lily Lake we took the Storm Pass Trail southwest. After about 0.4 miles, the trail descends a couple hundred feet to Aspen Brook, then climbs northwest for about 0.6 miles. This stretch occasionally offers some great views of Lily Mountain and Lily Lake. The trail then heads southwest, steadily climbing to Storm Pass at 10,300 feet. At Storm Pass, the odometer showed 3.4 miles. The trail then heads northwest, climbing an additional 700 feet in 0.8 miles. We summited at 12:03, with the odometer showing 4.22 miles. There are great views on the summit of Estes Cone. The most impressive are Longs Peak and Mt Meeker to the southwest, and Twin Sisters to the east. You can also see Battle Mtn, Mt Lady Washington, the Mummy Range, and the Continental Divide in the vicinity of Flattop Mountain. The subalpine firs near the summit were just sprouting new red colored cones. We returned the way we came, getting back at 14:41, with a long lunch in between. The odometer showed 8.38 miles for the entire trip, with a total time of 4 hrs, 13 minutes. A bonus to this hike was a variety of wildflowers at the peak of their color.